Hanadama is a label printed on the appraisal describing a minimum pearl quality standard as set forth by the opinion of The Pearl Science Lab; a small private company that operates in Japan that appraises pearls. There are numerous companies in Japan that market under the "Hanadama" appraisal label. American Pearl is the originator of selling The Pearl Science Lab's Hanadama certified p earls on the internet and continues its reputation as the quality and price leader. It is important to understand that every strand of pearls submitted to The Pearl Science Lab is unique; as no two pearls are the same. In addition, "Hanadama" is not an official grade. Mikimoto has popularized their own grading system of AAA, AA, A+ and A, which is different than that of The Pearl Science Laboratory. 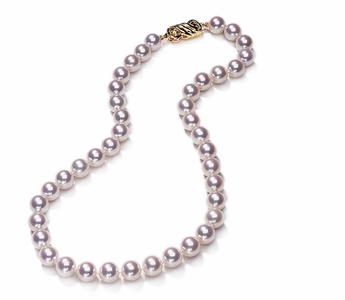 Furthermore, the Mikimoto AAA surface quality is spotless or blemish- free (the pearls are cleaner), whereas the very best surface grade for a Hanadama necklace is "very slightly imperfect." Therefore, the "Hanadama" label assigned by The Pearl Science Lab can represent a range of quality, making a Hanadama necklace only as good as the pearl strand submitted. 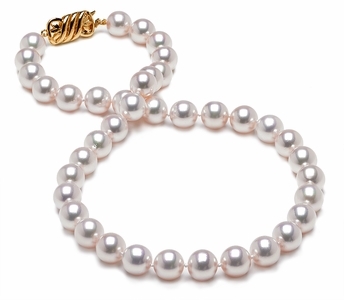 Still, we offer fine-quality Hanadama pearls at American Pearl which feature breathtaking cultured Akoya pearls. When you purchase a Hanadama pearl necklace from our store, you'll get a certificate with an authentic numbered report from the Pearl Science Laboratory. The team at American Pearl can upgrade many of these beautiful necklaces with free yellow or white gold clasps, or you can order yours with a platinum clasp for an extra fee. As always, you can count on excellent, wholesale prices on fine-quality pearl jewelry at American Pearl . If you are interested in Hanadama, please contact us for availability before ordering.